A rare NCAS summer lecture is scheduled, featuring Glenn Branch, the Deputy Director of the National Center for Science Education, who will give a talk on doubt and denial as challenges in climate education. Thursday, July 7 at 7:30 PM at Chevy Chase Library, 8005 Connecticut Avenue, Chevy Chase, MD. 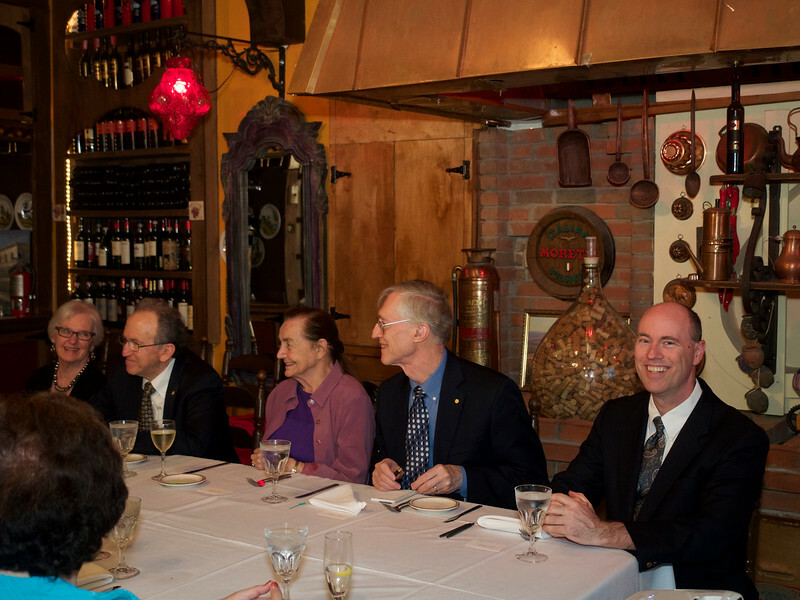 On May 3, NCAS members and guests gathered at Positano Ristorante Italiano in Bethesda for the first Philip J. Klass Award presentation dinner. 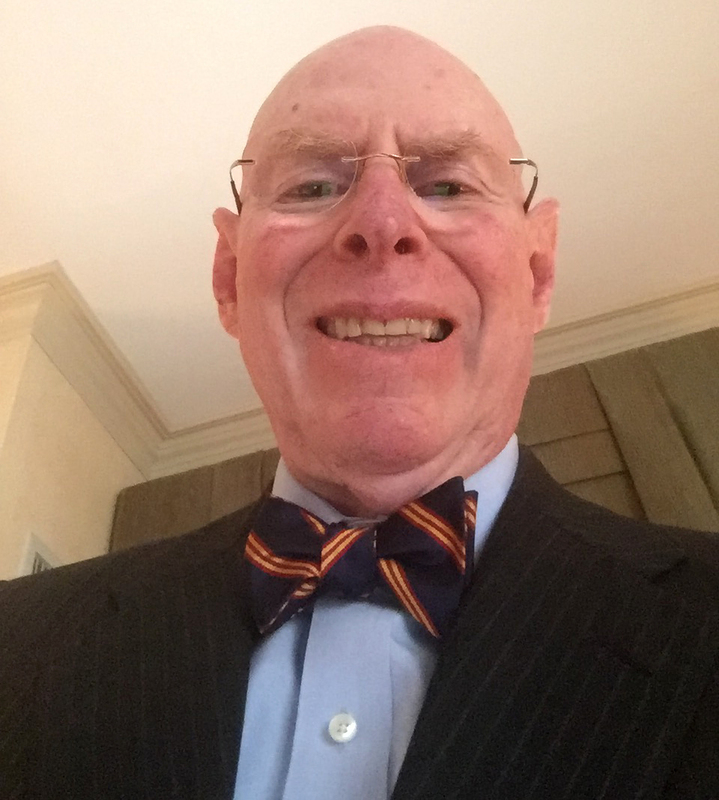 NCAS president J. D. Mack presented the 2016 NCAS Philip J. Klass Award for outstanding contributions in promoting critical thinking and scientific understanding to Dr. John Mather, Senior Project Scientist for NASA's James Webb Space Telescope. The award presentation was followed by Dr. Mather's talk on "The History of the Universe from the Beginning to the End: Where Did We Come From, Where Can We Go?" Special guests for the evening were John and Jane Mather, and Michael and Deanna Hauser. Drs. Mather and Hauser were members of NASA's Cosmic Background Explorer (COBE) science team. Launched in 1989, COBE obtained the first precise measurements of the cosmic microwave background glow, with results that confirmed an essential prediction of the Big Bang model of the origin of the universe, and revealed the expected slight background temperature variations indicative of early matter distribution that evolved into immense cosmic voids and galaxy filaments as the universe continued to expand. For this work, John Mather and George Smoot equally shared the 2006 Nobel Prize in Physics. Hauser, Smoot, and sixteen other members of the COBE science team shared half of the 2006 Gruber Prize in Cosmology, with the other half going to Mather. Though NCAS also honors Dr. Mather's scientific contributions, primarily the 2016 Philip J. Klass Award was presented to him for his dedication in describing to the public what he and his colleagues discovered, how it was done, and what will be done to continue the pace of discovery. The presence of Dr. Hauser and his wife at the Klass Award dinner was a surprise to Dr. Mather, who considers Hauser a mentor as well as a friend and colleague, dating back to 1974 when they and other team members began developing the COBE concept. 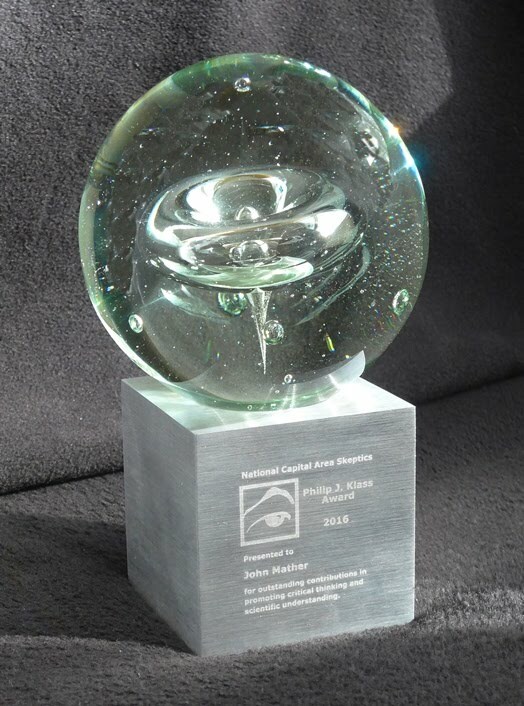 NCAS created the Philip J. Klass Award in 2006. Previous recipients were Michael Shermer, James Randi, Robert L. Park, Paul Kurtz, Ray Hyman, Joel Achenbach, Penn & Teller, Phil Plait, and Steven Salzberg. Deanna Hauser, Michael Hauser, Jane Mather, John Mather, and NCAS president J. D. Mack. 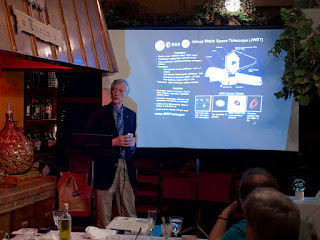 After accepting the Klass Award (right), John Mather describes the James Webb Space Telescope, an ambitious project to observe the first stars and galaxies forming, reveal the birth and development of other solar systems, and examine the atmospheres of planets orbiting other stars, starting in 2018. NCAS has no events planned for Friday, May 13, but encourages our members to celebrate the silliness of superstition by flouting unlikely harbingers of doom. (Sensibly of course...wear eye protection if you smash a mirror, be careful when walking under a ladder, etc!) Meanwhile, we're still wondering how one of the better days of the week could get such a bad rap. Shouldn't Monday be the prime suspect for bad luck? There were a few developments shortly after the April Shadow of a Doubt news item ("Hillary Clinton Discusses UFOs/UAPs and Plans Government Disclosure"). CNN's Jake Tapper asked John Podesta, chairman of Hillary Clinton's presidential campaign, what his candidate will do regarding "government disclosure" of UFOs (which Podesta calls UAPs, Unidentified Aerial Phenomena) if she becomes President. After telling Tapper that Hillary Clinton plans to declassify as many government records pertaining to UAPs as possible, Podesta noted that "...President [Bill] Clinton asked for some information about some of these things, and in particular some information about what was going on at Area 51, but I think the U.S. government could do a much better job in answering the quite legitimate questions that people have about what's going on with unidentified aerial phenomena." Unfortunately Tapper did not follow up to discover why Podesta believes the U.S. government could "do a much better job" than it did in answering a President's request for information. Tapper also did not ask Podesta what was (presumably) inadequate about the many Freedom of Information Act (FOIA) requests for such information, submitted by and fulfilled for various UFO investigative groups and individuals over a period of decades. If Podesta believes that the most important records are still classified and thus protected against public release through the FOIA, why would even President Bill Clinton have been unable to learn about them? Podesta probably will never be able to prove to himself that the government records he seeks don't actually exist. That mindset may lead not only to eternal futility for him, but also to a susceptibility to the works of document forgers. The 2016 NCAS election is underway. In mid-April, your e-mail inbox should've received a single-cast secret ballot from "elections@ncas.org via surveymonkey.com <member@surveymonkey.com>". (NCAS will receive information indicating who voted, but nothing to indicate who cast each ballot.) Please vote by May 15, 2016.